To Europe With Kids: Happy Bastille Day! The Avenue des Champs Élysées in Paris would be a great place to be today! July 14th is Bastille Day, a French national celebration of the anniversary of the storming of the Bastille on this day in 1789. There are parades and fireworks and feasting in the City of Lights and celebrations all over the country. What is the Bastille? It was a fortified prison in Paris of which nothing really remains today. Some undemolished stones of one tower of the fort were discovered during excavation for the Métro in 1899 and are displayed now in Square Henri-Galli. The original location of the Bastille is now the Place de la Bastille, a bustling city square. 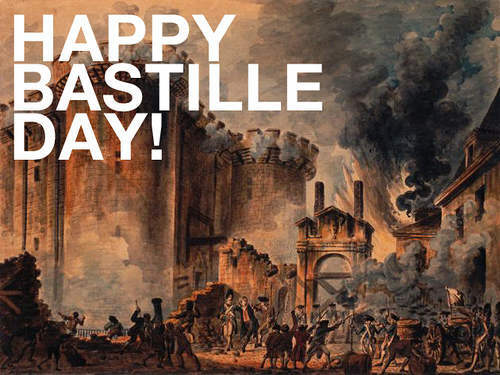 Why was the Bastille stormed and by whom? A crowd of commoners, eventually reinforced by French infantry, rioted at the prison until they were let inside, whereupon they collected ammunition and gunpowder for their weapons and freed the prisoners. The siege was an act of rebellion against the monarchy and helped fuel the French Revolution. I've never been in Paris on Bastille Day myself, but was once in Monte Carlo on July 14 where there was a spectacular fireworks show over the harbor. The city of Liège in Belgium as well as some locations in London also celebrate Bastille Day. 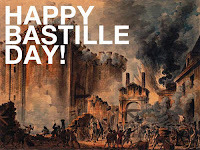 in French we "just" say "14 juillet" (July 14th)... we never reference the storming of the Bastille in 1789.
and, in France (and in French), we never wish "happy Bastille Day" (nor happy 14 juillet)... we do wish "happy ..." for several other days like Easter, Chrismas, Valentine day, ...but not for that day. Why? no idea! This year I went to Eiffel Tower fireworks...was just great! Thanks so much for the insight on this, Camille! I appreciate it!